Christmas is a fond memory, and 2015 is in full swing with spring is almost upon us; but that doesn’t mean the icy weather has left us just yet! Accidents caused by slips and trips are never higher than during the winter and autumn months. This is due to a number of reasons; such as the lack of daylight, fallen leaves and icy roads/pavements. When ice and snow builds up on pathways it can make the simple task of walking extremely precautious and dangerous. 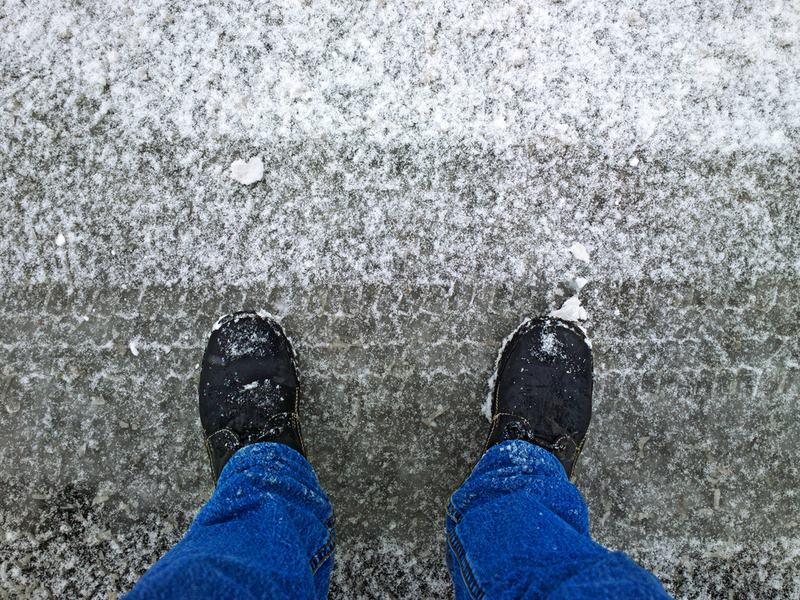 There are a number of things you can do to ensure your business premises reduce the risk of slips and falls caused by cold and icy weather. It doesn't matter how big or small your business grounds are, as a business owner it is your duty to protect your staff and the public that enter your property. In order to combat the effects of ice, frost and snow you must first identify the outdoor areas that are regularly used by pedestrians and/or staff members. Entrances, car parks and inclined/declined pathways are of major importance here. You should monitor the weather and temperature every day and be ready to take action when the freezing cold sets in. Use the Met Office to monitor and prepare for the weather. Have a plan put together and ready should the eventuality of frost be on the horizon. Grit should be stored next to areas prone to ice and slippery surfaces and applied at the first sign of frost. In time of high frost and ice, try to divert people to one single pathway that is less slippery than the others. Keep Your Grit Bin Topped Up! Gritting is the most common and most cost effective method of de-icing floors and pathways. Rock salt, or grit, is easy to store and apply and is used widely by the highways agency to de-ice our motorways and roads. Salt prevents ice from forming and can also melt existing ice too. The best times to grit your pathways is early in the evening and first thing in the morning. Of course it is also important to keep an eye on it during the day, as adverse weather conditions may require you to keep topping up. Try not to grit whilst it is raining too as the salt will simply wash away. Try to do it in dry conditions so that the salt sticks to the path. In order to properly facilitate this requirement you should litter your premises with grit containers. These grit bins, as they are known, must always be topped up ready for action. Keep the Accident Book Clean! According to HSE’S RIDDOR report (Reporting of Injuries, Diseases and Dangerous Occurrences. Regulations 2013-2014), approximately 1 in every 526 UK employees have injured themselves due to a slip or trip. Between 48 and 77 out of 100,000 employees in the UK have also injured themselves by falling. These figures might not be too staggering, but when you consider that slips, trips and falls account to an estimated loss of 1.5 million working days per year; you really see the significance of the issue. Another report from HSE claims that between the years 2013 and 2014, slips/trips were the most common cause of major injuries to employees in the UK. So as you can see, it is vitally important that you do your bit to keep your grit bin topped up, your pathways clear and your accident book empty! As an employer you must take every precaution to ensure that your employees are safe. As well as gritting, you should always place vibrant warning signs in places where there are icy conditions; warning your staff members and the public of the situation. If you would like some more information on grit bins and how to stores your rock salt, give our team a call and they will be more than happy to help!